Americans are quite used to the use of breathalyzers and alcohol testing by our police officers around the country. But did you know that law enforcement officers are increasingly considering using drug testing in the same way? For example, Lord Adonis, British Secretary of State in the Department for Transport, recently appeared on the radio to discuss the British government’s interest in changing the law so that police officers in the UK can use a saliva drug test to determine whether a driver is impaired on illegal drugs. (Read the article at UK magazine The Engineer’s website). The law currently provides only for observation based tests. The reason a saliva drug test would be such a great tool for law enforcement officers is that it picks up very recent drug use. Unlike a urine drug test, this test picks up some drugs as recently as 5-10 minutes after their use, and detects marijuana within an hour of use. Results come from a saliva drug test within 5 minutes. They are a tool that officers in Australia have found particularly useful. 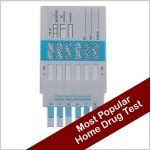 A saliva drug test is the best drug test on the market if you would like to know about very recent drug use, or find out if someone is currently high. And it’s not just the police that can use these tests. They are available to consumers. You can purchase one here at http://www.homehealthtesting.com/saliva-c-21_28.html.